Home » Solo Travel » Sweetness at Robinson’s Pecan House, Lamont, Fla.
Sweetness at Robinson’s Pecan House, Lamont, Fla.
Honey, honey. Sugar, sugar. When traveling along Southeastern United States back roads I know there’s a good chance I’ll find groovy photo opportunities and stumble upon delicious treats found only in the South. The weekend had me in Tallahassee for a conference and although I just wanted to get home on Sunday, I ventured along U.S. Hwy. 27 in hopes of finding some golden tupelo honey. 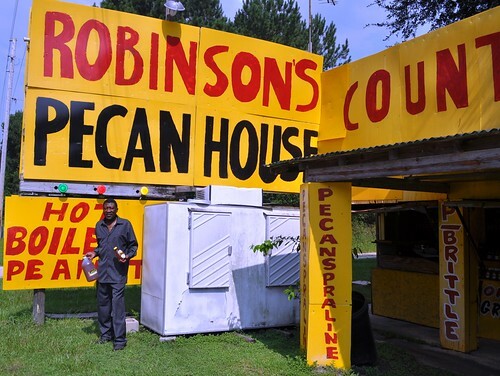 About 35 minutes east of Tallahassee I found Robinson’s Pecan House, full of sweet goodness with its tupelo honey, mayhaw jelly, pecans prepared in three different ways, and pickled items. Importantly, I met owner Arthur Robinson, who took over the family business when his brother passed away a few years ago. It was about 11 a.m. and suspect I was the first customer of the day. The man missing a front tooth took time to share his assortment of pecans such as toasted with salt, praline and natural buttered (sweet and my favorite!). 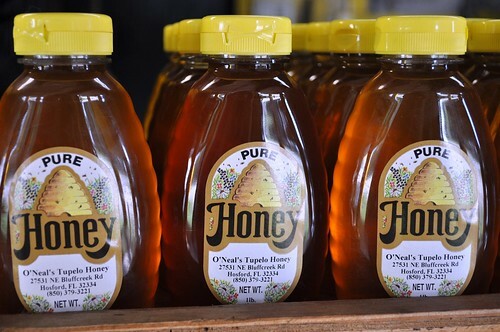 I was on a mission just for Tupelo honey and ended up leaving with about $40 worth of honey and pecans. An article from a local newspaper proudly displays the news about Arthur’s brother appearing on a television show with Bill Cosby. This brother was one of a set of triplets in the family and Arthur was the youngest of 18 children. He lost his front tooth earlier this year while eating a ham hock during a Mother’s Day celebration and it will cost $2,200 to replace. Yowza! I’m hoping some of my purchase will help Arthur get a new tooth. If traveling to Tallahassee, take the road less traveled to Robinson’s Pecan House to say “hello.” You’ll be glad you did. Credit cards not accepted but cash and checks are. 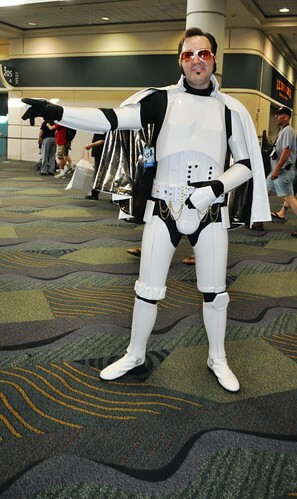 Check out additional photos from my visit over on Flickr. My husband and I stopped by his stand on our way back home to Alabama. We wanted something different, something family made, and something yummy. 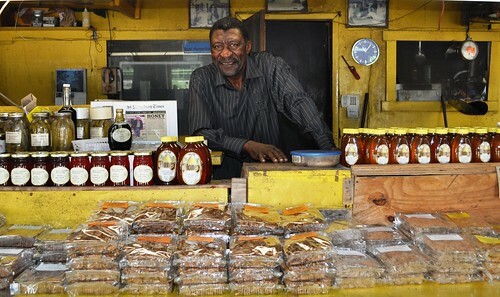 We ended up buying his really good Praline Pecans and some of his finest Pecan Maple Syrup. We are so glad we stopped. Delicious! I’m so glad you stopped, too, Lisa!